Did you know North America used to be filled with wetlands? What a wild thought when you look at our present day landscape where fewer than 20% of wetlands remain in many developed areas. Did you know that wetlands are one of nature’s most valuable ecosystems? Wetlands provide numerous ecosystem services, including but not limited to flood control, groundwater recharge, carbon sequestration and natural water filtration. These are just a couple of eye opening facts that enticed eager participants to attend the 2013 West Kootenays Wetlands Institute! This is the 11th Institute the BC Wildlife Federation has run to train wetland stewards throughout the province. The Institute was kicked off with Wetlands Education Coordinator Neil Fletcher explaining the importance of wetlands and the need for training wetland stewards. 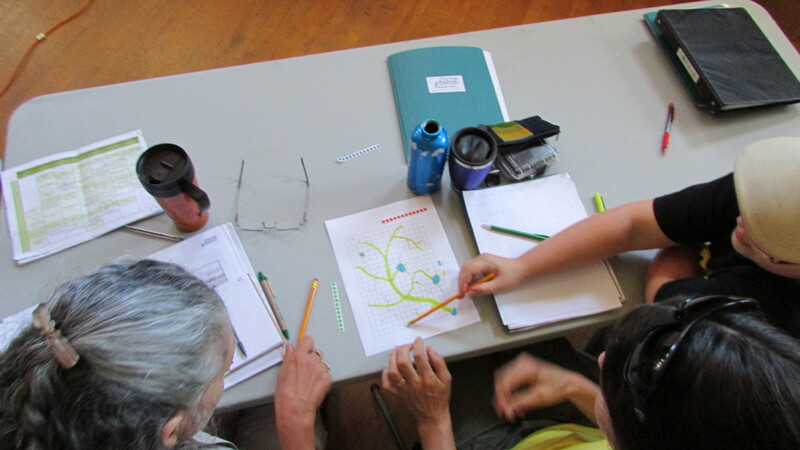 Nearly 30 participants took on the challenge – travelling to Salmo, Castlegar and Passmore throughout the week to learn a broad skillset including plant and invertebrate identification, wetland classification, how to source funding for wetland projects and methods to engage the public to support wetland restoration! Participants varied in area of expertise (from habitat officers to wood workers) and location (arriving from as far as Terrace), but were unified in their concern and interest in promoting wetlands. Tom Biebighauer, keynote trainer and speaker from the Center for Wetlands and Stream Restoration, started off with a BANG as he provided a history of wetland drainage in North America, explaining the extensive feats people went through to drain wetlands including the use of DYNAMITE! Biebighauser has built over 1500 wetlands, restoring wetlands throughout North America to help return the landscape to its habitat rich, naturally infiltrating wetland filled glory days before European colonization. Participants assisted with the restoration of several wetlands during the Institute, including restoring a wetland to improve its ability to retain stormwater near KP Park in Salmo, B.C. and the enhancement of a wetland complex at Tulaberry Organic Farm in Passmore, B.C. During these restoration activities, participants got hip deep in wetlands, sourcing onsite natural materials to build toad houses, dragonfly perches and rock bridges! Participants worked together to plant cuttings, saplings and seed the ground to prevent invasive plant species from colonizing the new habitat. 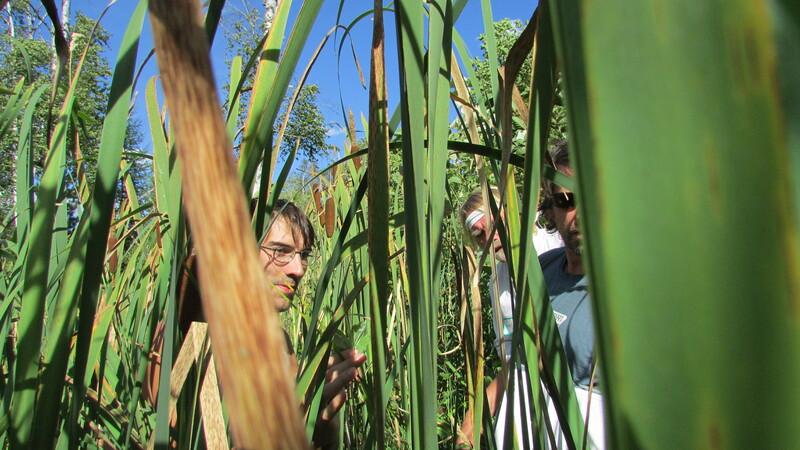 Biebighauser gave hands-on training on wetland design and restoration planning, from using construction rod and levels to sampling soil types. Thor Smestad of Treebear Native Plants and Ecological Services assisted the planting by teaching participants how to successfully plant live stakes. At Sunshine Bay Regional Park participants met with Kurt and Jennifer Dehnel of the Harrop Riparian Society who explained how, over the years, some wetlands surrounding Kootenay Lake have been degraded due to heavy recreational use by dog owners, ATV users, and horse-riders. Participants learned how The Harrop Riparian Society is working with the community and those that recreate in the wetlands to increase education and encourage wise use. Other engaging activities included: hands-on inspection of a demonstration boat for potential zebra mussels with the Invasive Species Council’s Clean, Drain, Dry program representative Sarah MacCrimmon, cutting seed-heads from invasive yellow flag iris (Iris pseudacorus) at Mel Deanna Pond with the Central Kootenay Invasive Species Committee’s Jen Vogel, and for the early bird a chance to monitor waterfowl and songbirds with seasoned expert Janice Arndt (piloting a new Marsh Monitoring Bird Monitoring protocol for BC). Other speakers included: Jennifer Yeow of the Slocan River Streamkeepers; Claire de la Salle from Kootenay Conservation Program and Russ LaRoche, Woodlands Manager with FLNRO. Yeow provided an overview of riparian and wetland monitoring initiatives in the Slocan Watershed. The Slocan River Streamkeepers have been collecting data since 2006, which is proving helpful in evaluating how the recent jet-fuel spill has impacted Lemon Creek. Claire discussed approaches for partnering with private landowners with wetlands on their property, landowner stewardship, and opportunities for wetland protection. Over the years, the Kootenay Conservation Program has helped conserve over 300,000 hectares of high value land, including wetlands. LaRoche led a discussion involving forestry related regulations that relate to wetlands management. He suggests being active and knowledgeable about forest operations in your neighbourhood is a great way to protect wetlands in forested areas. Brain Heise, Associate Professor of Limnology and Fisheries and Chair of the Department of Natural Resource Sciences at Thompson Rivers University gave an engaging presentation complete with role play demonstrations of invertebrate survival tactics! Participants got the chance to identify live invertebrates under the microscope, which they had collected on an invertebrate reconnaissance mission at near by wetland in Passmore (not to worry, participants diligently returned the inverts to their wetland habitat). To strengthen the capacity of participants to communicate their wetland/conservation initiatives Lorna Visser of Carmanah Strategies taught how to target a specific audience, make ‘sticky’ memories and craft messages that direct the audience to an end-state behaviours (as opposed to getting your audience only half-way to the finish line). Continuing the communication stream, Rachel Schott with the BC Wildlife Federation shared tips of how to use social media to enhance and promote wetland/conservation initiatives. For sourcing funding for wetland projects, Fletcher gave tips on how to write a successful grant while Irene Manley from the Fish and Wildlife Compensation Program provided insight of how grants are evaluated by the FWCP. We were fortunate to have three speakers present to Institute participants on Tuesday and to regional, municipal and public representatives from the West Kootenay’s during a 1-day Wetland Workshop on Wednesday. Deborah Carlson of West Coast Environmental Law addressed the issue of legal framework not explicitly protecting wetlands but provided an overview of how the Green Bylaw Toolkit can be used to help protect and restore wetlands. Greg Sauer, a municipal planner from the City of Kelowna, gave an overview of land use planning, focusing on protecting and restoring wetlands via mapping tools and municipal policies. Graham Watt, coordinator of the Kettle River Watershed Management Plan, addressed challenges of working with the watershed as a management unit and introduced watershed scale tools and techniques to protect wetland and riparian areas. After a week filled with engaging presentations, multi stakeholder discussions and muddy gumboots, participants left the Institute as knowledgeable wetland stewards and refined approaches for their individual wetland projects. Go forth and restore wetlands! The 2013 West Kootenays Institute photos click here!! The Institute would not have been possible without the financial support of Habitat Conservation Trust Foundation, Wildlife Habitat Canada, Columbia Basin Trust, Fish and Wildlife Compensation Program, the Real Estate Foundation of BC, Shell Canada, Environment Canada and the Government of British Columbia.